They were both built for the 1978 World Cup and both opened in mid-May, just before the planned tournament. Now each of them has a fresh look, though, as they were renovated for the 2011 Copa America. Built with central budget funding, the stadium was completed in the rush ahead of 1978 World Cup, of which it hosted 5 group games and 3 ties of the knock-out phase. Its opening took place just weeks ahead of the tournament, on May 16. The stadium is located in north-eastern Córdoba, surrounded by public green. For years its stands were criticized for poor view of the field. They weren’t only far from the pitch with athletic track around it), but also were in a shallow sunken bowl, making the worst seat be located 80 meters from the field! Only the main grandstand offered better conditions, not only providing a roof over its second tier, but actually having a second tier with steeper incline. Due to negligence it wasn’t renovated until 2011, when it went through a complete revamp ahead of the Copa America. The eastern land-supported stand received a second tier with cover, while both end zones were removed and replaced by single-tiered steep ‘kop’-style stands, also covered and slightly moved towards the pitch. Formally the stadium has no host to use it on a day-to-day basis, but most popular local teams use it frequently, with Belgrano and Talleres leading the run. Fans of the latter team presented one of the world’s largest flags once the stadium was redeveloped, in 2012. Apart from club fixtures the stadium also hosted Argentina’s national side and popular football tournaments. Apart from the 1978 World Cup also Copa America was held here in 1987 and 2011 and U21 World Cup in 2001. These events were joined by numerous gigs by best-selling performers, including Madonna, Aerosmith or Shakira. Construction of the new stadium in Mendoza began in 1976 as authorities sought for a site to host the 1978 World Cup granted by FIFA. The chosen site lied beside the central park. On one hand the stadium was close to the heart of Mendoza, but on the other – outside city limits. Single-tiered bowl was partly sunken into the ground and only the main stand offers partial cover. Still, despite passing time the concrete support of the roof, which also accommodates commentary positions, makes quite an impression. During the 1978 tournament Group D games were staged here, including Peru, Netherlands, Scotland and Iran. It wasn’t easy to find a permanent tenant afterwards, though. A total of 7 local clubs use it on various occasions and even teams from Buenos Aires (1,000km east) come here, even with the River-Boca ‘superclasico’. 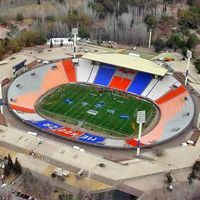 The stadium also hosted Argentinean national team in a friendly against nearby Chile, it was also the sight of 2011 U21 championships, harvest celebrations and various other events, including rugby and political appearances. It wasn’t until 2011 that the stadium received a thorough renovation with seats installed along the pitch (ahead of the 2011 Copa America). Ends were left terraced, but with a new paintwork.